Postdoctoral researcher Arif Hamid and graduate students Kavin Nuñez and Shawn Williams have earned competitive fellowships from the Howard Hughes Medical Institute to support their academic careers and their desire to become role models in science. PROVIDENCE, R.I. [Brown University] — With humility even at a moment when they’ve been selected for significant honors, three young Brown University life scientists emphasized that they would never be where they are today without the generous guidance of many mentors. Now, as they accept the prestigious fellowships from the Howard Hughes Medical Institute (HHMI), Arif Hamid, Kavin Nuñez and Shawn Williams all say that they are dedicated to becoming the mentors they know firsthand can make an existential difference in the careers of young scholars, particularly from historically underrepresented groups and low-income backgrounds. Hamid’s Hanna H. Gray fellowship will provide him with financial and mentoring support for the next eight years as he completes his postdoc with Brown professors Christopher Moore and Michael Frank — and then early in his career as an assistant professor, wherever that turns out to be. Meanwhile, Nuñez’s and Williams’ Gilliam Fellowships for Advanced Study will offer financial assistance for the next three years of doctoral research, providing them with networking opportunities and providing mentoring training for their faculty supervisors, Professors Karla Kaun and David Rand, respectively. HHMI selects fellows from a competitive pool of applicants based on their academic excellence and their potential to become leaders in their disciplines and to inspire a diversity of young scientists. The three selected at Brown each tell a story of how the encouragement of teachers and professors helped them as they pushed past barriers — barriers that they hope to help others overcome, too. Years before Hamid earned a University of Michigan Ph.D, started as a Brown neuroscience postdoc and became an HHMI fellow, he worked as an overnight security guard at a General Electric factory to fund the relaunch of his education at a Minneapolis community college. He would work full time, catch quick naps and then head to class and volunteer for research. 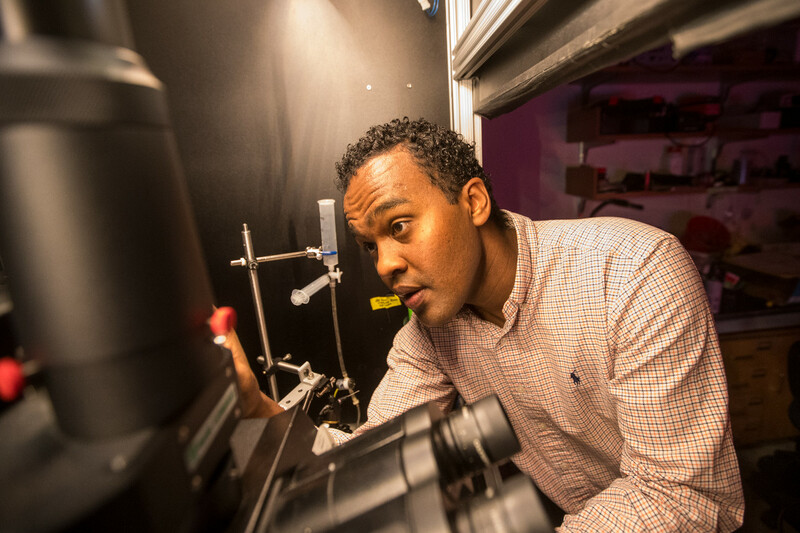 With a strong interest in physics, he had emigrated from Ethiopia at the age of 15 to study aerospace engineering at the University of Oklahoma. After a couple of years, he came to realize that the field might not be the right fit, and he struggled to fit in so far from home. So he moved to Minneapolis, which has a substantial population of Ethiopian immigrants, and started over. That’s when he met chemistry professor Eugenia Paulus, who encouraged him to start an independent research project. He gathered snow samples from around the city and analyzed them for toxic organic compounds. She helped him present his research national symposia, including an American Chemical Society conference where he won an outstanding poster award. To complete his bachelor’s, he transferred to the University of Minnesota, where Janet Dubinsky and Eric Newman introduced him to neuroscience with a project that would presage his work at Brown by examining the interface of behavior and the endocrine system. He also became grant funded and therefore no longer had to work night shifts. At Michigan, he began work in the lab of Professor Joshua Berk, whom he credits as “my intellectual father.” With Berk, he embarked on a study of the crucial but hotly debated role of the neurotransmitter dopamine in the brain circuits that govern motivation, reward and learning. When Hamid graduated, he knew he wanted to continue his studies at Brown, where he said Moore and Frank are acknowledged as being at the forefront of computational and experimental methods for studying not only dopamine and the circuits it affects, but also the vital role played by hormones circulating in the blood. On campus, he’s literally watching those dynamics play out in the brains of rodent models using a two-photon microscope. The work reminds him of when he was fascinated inspired by the optics bench in the physics lab of his Addis Ababa high school. The journey from there to here, he said, has helped him grasp the immense value of opportunity, support networks and mentorship. It’s also encouraged him to perform the same service for others. He’s already worked in organizations and individually to inspire young students in Minnesota and Michigan. Kavin Nuñez, a graduate student in the Department of Molecular Pharmacology and Physiology, says his parents are “insanely proud” of him and his sister, a graduate of Pace University who is now a nurse in Bronxville, N.Y.
College was not a given growing up. In the Dominican Republic, his mother only attended college for a year and his father left school in his early teens to work in his small farming village. When they immigrated to New York, Nuñez’s parents worked in neighborhood grocery stories for years before eventually coming to own one in Yonkers. Though he has since twice gained admission to Brown, for undergraduate and then graduate study, Nuñez said he didn’t dream at Lincoln High School in Yonkers that he’d ever get in, even though he was the valedictorian. It took the encouragement of Principal Edwin Quezada for him to even apply. Quezada saw what Nuñez had accomplished with the inspiration of chemistry teacher Usha Johal and physics teacher Megan Huron, mentors that Nuñez still talks to. They are the ones, Nuñez said, who turned him on to studying science and imagining it as his future. Nuñez said he was always asking how even the sometimes “little” phenomena in the world around us — like the refraction of sunlight — happen. But part of his early inspiration was anything but small. When he was 14, the last time he visited the Dominican Republic, his grandfather had a stroke and became paralyzed from the neck down. In his grief, he asked how that could happen and began to think about becoming a doctor. When Nuñez took an introductory neuroscience class at Brown, the professor described BrainGate, in which researchers are working to help restore movement for people with severe paralysis like the kind that afflicted his grandfather. It kindled an interest in neuroscience and research — he realized that medicine wasn’t the only path. With the desire to explore research he found the Rhode Island Hospital-based lab of Dr. Suzanne De La Monte, a professor of pathology and of neurosurgery, and graduate student Valerie Zabala, a 2015 Gilliam Fellowship recipient now in her fourth year.. Through their mentorship, he came to love studying the molecular dynamics of the brain, including how alcohol can affect them. When it came time to apply to graduate schools, Nuñez wanted to stay at Brown to continue similar work. It didn’t take long. 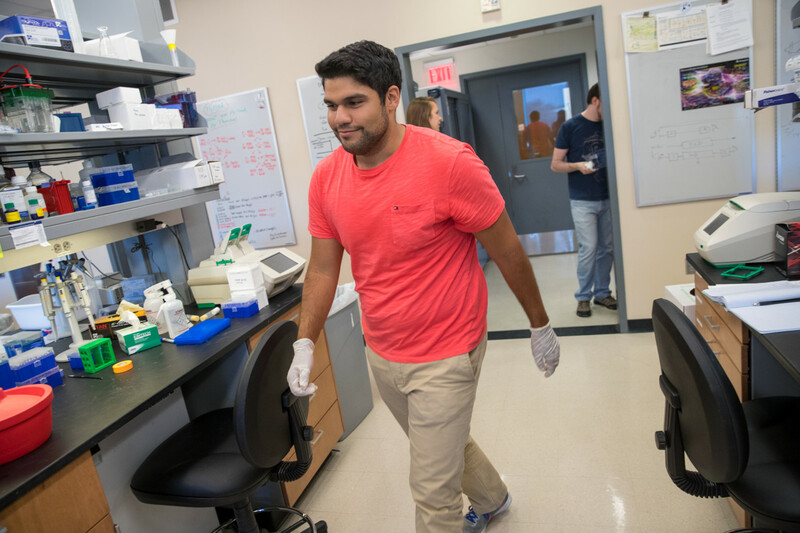 His first interview with potential faculty supervisors was with Kaun, who studies the neuroscience of alcohol addiction in the model of flies. When he did a rotation in her lab, he said it felt like being part of a family. His research concerns the role of neurotransmitters in the brain circuitry that form memories for “rewarding” alcohol experiences and how stress might cause relapse and result in alcohol cravings. He said the Gilliam fellowship provides not only the support, but also the inspiration to keep striving toward a career in the sciences and to become a mentor to others. Shawn Williams came to Brooklyn at the age of 16 to live with his aunt. His mother remained in Jamaica. 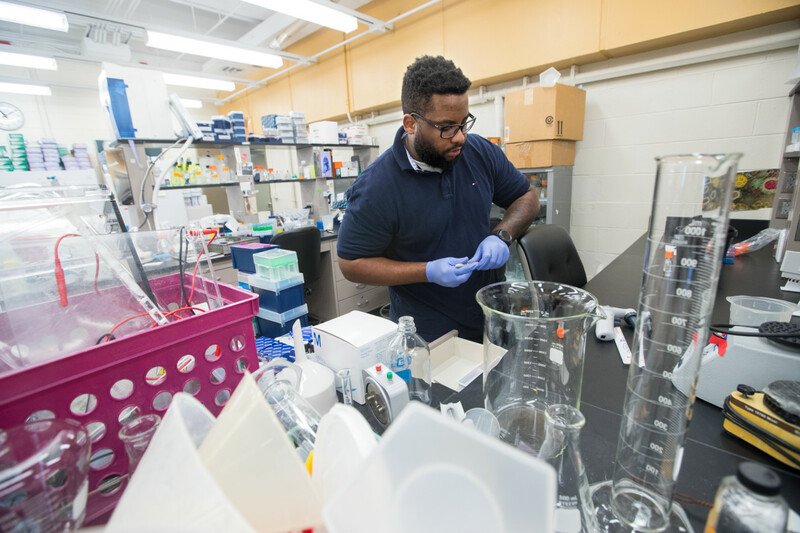 That’s how Williams, now a graduate student in molecular biology, cell biology and biochemistry, became the first member of his family to go to college. It took the urging of his French teacher, Madeline DiLorenzo, for Williams to take the SAT, though he could barely find the money to do so, he said. He could only afford to pay for a few college applications and didn’t enroll in the City University of New York’s John Jay College until he was 20. By working 50-hour weeks in security at Target and then Sears, Williams saved up and paid his way through earning his bachelor’s degree in forensic science, with a concentration in molecular biology. Williams liked science in high school and loved watching science-infused crime shows like “CSI,” but he didn’t imagine it as his career. Instead, at John Jay, he took the city’s police exam figuring he might go into law enforcement. When he took a biochemistry course, he met Professor Artem Domashevskiy, who told the class how in 1978 a KGB agent allegedly murdered a Buglarian dissident journalist named Georgi Markov by jabbing him with an umbrella tipped with the poison ricin. Domashevski was studying whether ricin could be turned into an antiviral drug. Williams was inspired and went to work with Domashevski in his lab. With the professor’s guidance, Williams became enamored with research as a career path. Williams found out about Brown when he went to the ABRCMS conference for underrepresented students in the sciences. He met a Brown graduate student who had graduated from a CUNY school, who encouraged him to apply. At Brown, Williams has begun working in Rand’s lab, studying how distinct DNA in the nucleus and in the mitochondria interact to affect metabolism, particularly that of lipids. In the fly models he studies, these questions directly affect their lifespan. When he first arrived at Brown, he said, he benefitted greatly from programs like the Initiative to Maximize Student Development, which not only provides incoming students with preparation for graduate-level research but also helps to forge community among science graduate students from underrepresented groups. He still recalls hearing Graduate School Dean Andrew Campbell address head-on the self-doubt that he and surely others felt: that maybe he didn’t really belong. “The reason you are here is because we believe in you and we feel you have what it takes,” he quoted Campbell as saying. Winning a Gilliam fellowship has helped to bolster that confidence anew, Williams said, and it has reinforced his already strong motivation to convey the inspiration to others that they, too, belong in science. Working with fellow students organized by graduate student John Santiago, for example, Williams has been part of the Brown Junior Researchers Program, in which students teach kids in local Boys and Girls Clubs about science. After graduate school, Williams wants to not only conduct research but also teach. “That puts me in a position to help others like me,” he said.